Reveal cards are a popular alternative to using a traditional letter and envelope. Reveal cards use a 12 pt. coated cover and are printed and sealed using a cohesive glue. The finished size of the card is 8.5 x 5.5. The recipient opens the card to reveal the content on the inside of the piece. Reveal cards a great option for a personalized direct mail campaign. 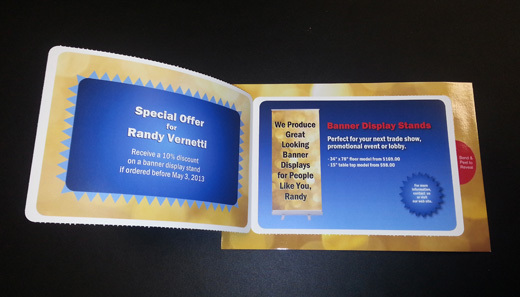 They provide the security of an envelope in and the "wow factor" of a unique direct mail item. They are ideal for announcements, greeting cards, invitations, solicitations, contests and much more. Contact us for a free estimate on using Reveal cards in your next direct mail campaign.